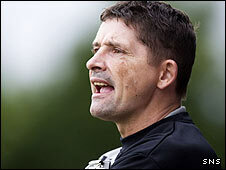 Allan Moore has left Stirling Albion to sign a three-year contract as manager of First Division Morton. And Moore, who spent a short time at Cappielow during a 20-year playing career, has been promised funds for up to eight new players. Moore, 45, will be up against his old team next season, having steered the Binos to the Second Division title. He replaces James Grady, who was sacked by the Greenock club after an eighth-placed finish in the league. Grady took over on a temporary basis when David Irons was dismissed last September and was given the job when when Morton balked at the compensation Stirling were demanding for Moore. However, Moore has finally made the switch to a full-time post after nearly eight years at Forthbank. Albion were languishing near the foot of the Third Division when Moore took over.